Now, on to yours (Kathy's)....if ever a review was convincing, this is. I'm definitely going to have to read it. I agree. Kathy did a great job with this review. Like, you, I'm going to read Belong to Me. Just posted my piece and thanks for the invite to be a part of the Book Review Club. I very much enjoy the feeling of community. Off to read all the other entries now. I adore, adore, adore Belong to Me! Such a great book (as is her other one, Love Walked In). Hi Kathy, nice review. You make me want to read the book from that quotation and your praise. Her Love Walked In is in my stack to be read already. Even when it turns out I've already read many of the books reviewed, I love to see that others did too. Belong To Me was excellent. Wow, so many books - so little time! I enjoyed your review, Kathy, particularly the excerpts. Great choices, I've added them to my "Must Read" list. I would love to add a little Cancon to your reviews, how do I get in on the reviewing? I just finished "The Book Of Negroes" by Laurence Hill, an unbelieveable read and "The Friday Night Knitting Club", light and easy but good. Next up "A Thousand Splendid Suns" and "Elegance of the Hedgehog" I would love to share some thoguhts with everyone. I loved your review, it sounds like the kind of book I would love. The best part of blogging is finding people with so many wonderful things to share. I'll add this book to my ever growing list of books I'd like to read. Three meetings already? Ya'll are off to a running start. Great rewiew! I agree about the writing in Belong to Me. It's very poetic. And piper is a wonderfully complex character. Good job making everyone want to read the book. WAIT! I won't have my review up until 11! i read another book by de los santos, but i can't remember the title--oh, oh! love walked in (or something like that). it was this same cornelia character, i believe. great review--i like that book cover! Wow, wow, wow, Kathy! And you read it 3 times. I'm not sure I ever read a book again all the way through - maybe only "Gone With The Wind" maybe that's why I don't after reading such a huge book twice. Where is the basket of muffins?? 'Grand Slams all around'...hee hee hee! I loved the excerpt--her writing is beautiful. Thanks for organizing, Barrie--I really enjoy this! it sounds so good. I can't believe you read it three times. I have to go and find this book. I adore Love Walked In, but haven't picked up Belong to Me yet. I shall have to put it on my list. In addition to the coffee and muffins, I wonder if I can't get a basket containing each month's books, to peruse at my leisure? I wish I could just quit my day job and read ALL THE TIME. But I think my kids would miss me. I have heard about this book and now I want to read it even more! 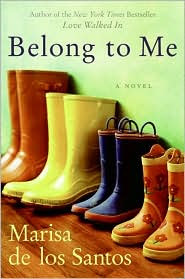 Oh, that "Belong to me" book...I'm gonna have to read that! I LOVED this book, too. It was so beautiful. I'm glad to read that you write! I'm "so going to check out your books!" Good luck with the book, Barrie. I hope it's coming along well! This blog is just a hub of activity. Reading, writing, reviewing. Wow. After reading this post, I really want to read Belong to Me!